Once you descend below 250 feet in the water, the penetrating rays of the sun quickly peter out and you enter the so-called twilight zone where light is faint and limited. Here, bioluminescent creatures glide by and you are embraced by a whole other world. The creatures here have evolved their own ways of dealing with the darkness. They have developed the ability to use chemicals within their bodies to produce light. 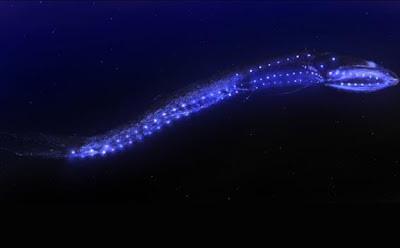 Bioluminescence is mainly a marine phenomenon and is not found in freshwater. For any serious diver this makes the ocean a great place to explore, and that is why Graham has designed a professional watch especially for these depths. 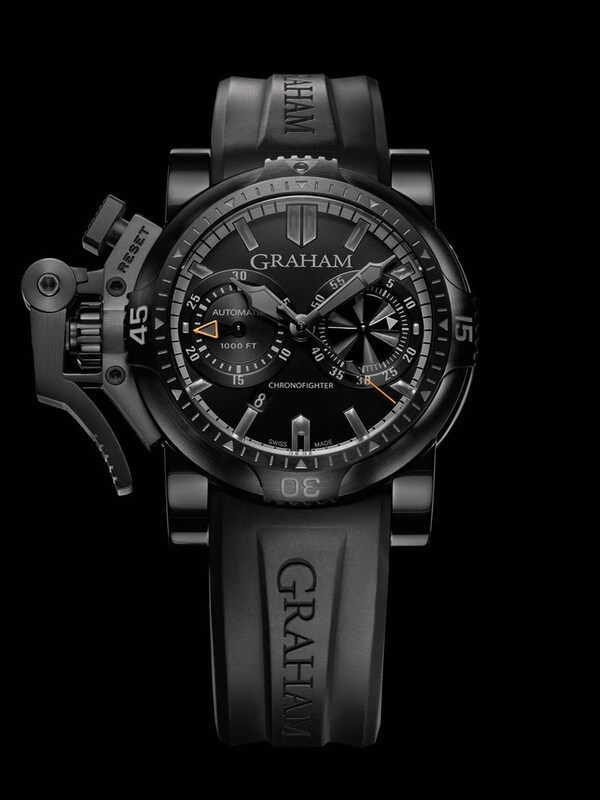 With its sapphire crystal with double-sided anti-reflective coating, the Graham Chronofighter Oversize divers watch is designed to help you track time in this amazing environment. The watch is 47 mm in diameter, resistant to 1000 feet / 330 metres and designed around the needs of the professional diver. The professional diver usually requires a built-in helium escape valve, which allows for a prolonged deep water trip. Of course this is featured on the Chronofighter too. When coming up from the depths after days in a diving chamber breathing Trimix or Heliox (a special divers gas for deep water work), this valve will equalise the pressure difference between the trapped gases inside the case and the surface. Helium is the world’s second smallest molecule, it will inevitably find its way into your watch if you spend some time in a diving chamber. The solution to this is to include a pressure release valve integrated into the 2 o’clock part of the case. But pressure isn’t the only consideration behind the design of this watch. 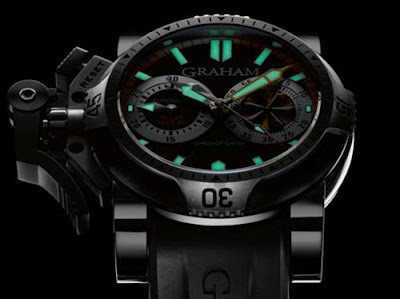 The Super-LumiNova coating on the dial and hands will also help you read time in the dark, as clearly. As easily, insists Graham, as you can see a firefly squid. Even with diver gloves on, the use of the trigger to activate the stop watch is intuitive. The same goes for the unidirectional rotating bezel for measuring dive and decompression time. Other features include: Calibre G1734, self-winding bi-compax chronograph, 27 jewels, 28’800 A/h (4Hz), 48 hours power reserve, and on integrated hypoallergenic black rubber strap.